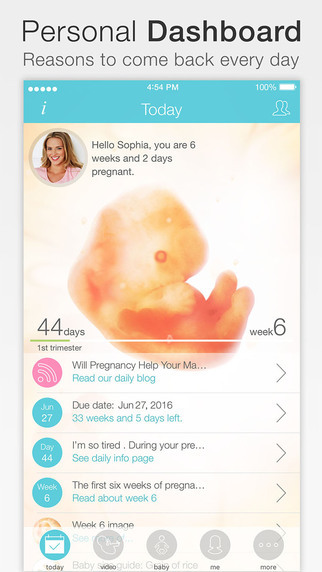 When it come to tracking your pregnancy, there is no short of apps to help you with the job. In today smartphone world with a tap on the screen, you can get all the info you need. While there are many pregnancy apps in the iOS and Android app store, it can be confusing to choose which one can help you the best. If you are having trouble choosing the best pregnancy app, read on and learn why these 15 apps are the best pregnancy apps to help you to track your pregnancy. Don't have time to check out all the apps? No problem! Use the 'Quick Navigation' table to jump to the app you like and find out more information about the cool app functions. Recommended by Time, NPR, USA Today, Pregnancy, Parenting, Fit Pregnancy and Pregnancy & Newborn magazines (and many more! 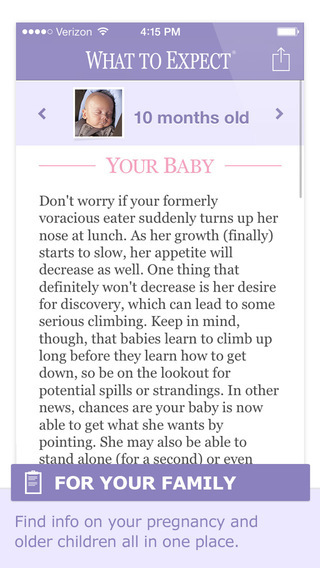 ), BabyBump (a free app despite the "Pro" in its name) provides comprehensive, journal-like features to record your daily symptoms, cravings, body weight, moods, and thoughts; the capability to customize your birth plan, daily pregnancy tip, and week-by-week pregnancy and fetal development information. BabyBump Pregnancy Pro also has a helpful pregnancy community forum where you can ask questions, get help, compare notes and share experiences with other parents. Other features in the app include a baby name generator that lets you search for names by the gender, origin or sound, a photo manager, a baby kick counter, a contraction timer and an online shop. 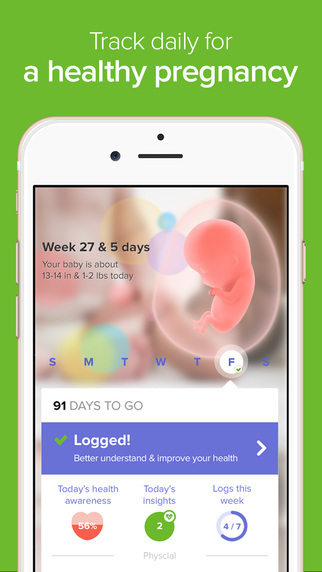 Touted as an Apple ‘Essential App for Parents’ and one of Time Magazine’s Top 50 Apps of the Year, Sprout is a trusted app for expectant mothers, helping them stay organized and educated about changes in their body and baby’s development. The app provides a hospital bag checklist and beautiful visuals of fetal development based on your expected due date. A premium upgrade provides additional features such as a pregnancy timeline, weight tracking, a contraction timer, as well as daily content from Parents Magazine. 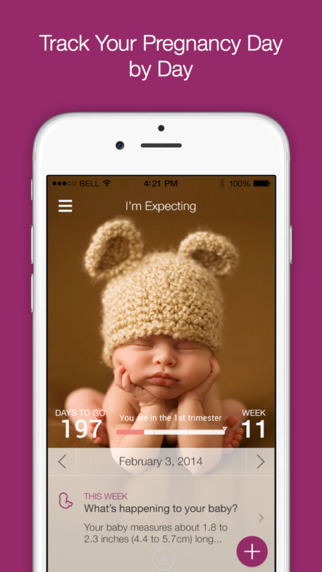 With Totally Pregnant, expectant mothers can personalize their experience in the app by entering their due date. 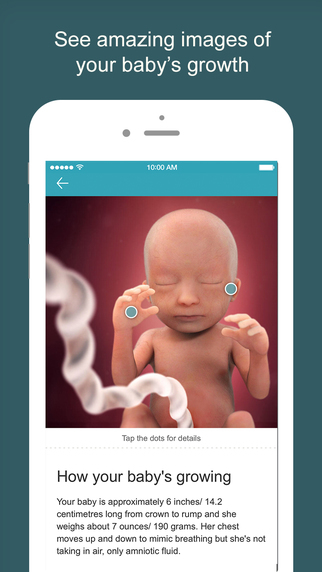 The app then delivers helpful information from 3D videos modeling baby’s development, to other informative videos, articles, and links to nearby baby shops and related healthcare services. There’s also a way for mothers to view their week-by-week pregnancy timeline, ask questions to experts and sign up for pre-natal yoga classes. Totally Pregnant does not design to serve the consumer market only, but they also serve the B2B market. Totally Pregnant is also designed to work with service providers like hospital who are interested in selling their services to pregnant mothers in their respective neighborhood. 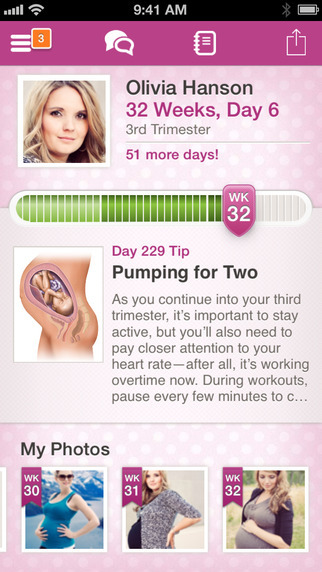 My Pregnancy & Baby Today is an app by BabyCenter that provides access to videos, articles, checklists, product reviews, and other tools such as a kick tracker, a contraction timer and a “bumpie” photo diary. 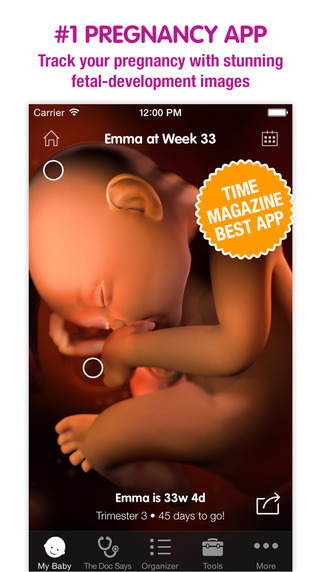 It provides weekly pregnancy tips and enables mothers to keep track of baby’s growth, with fetal development images and a daily calendar on their body’s changes as their pregnancy progresses. What great about My Pregnancy & Baby Today was that once at post-birth, the app then switches to daily parenting guidance to support the new parents through baby’s first year. This useful app also has an active message board feature that allows you to connect with other mothers and share stories, advice or experiences. With the I’m Expecting app, the first thing you would likely be drawn to is their home screen, welcoming you with photos of precious babies. 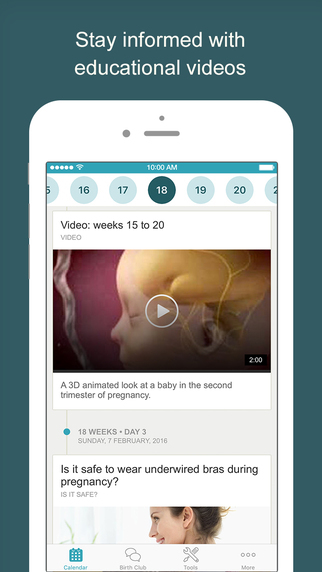 The app features daily and weekly updates on your pregnancy and fetal development. I’m Expecting also let you keep track of your pregnancy weight, symptoms, baby bump and other measurements. Their online community allows you to post questions and get in touch with other mothers, and the app integrates other apps and services from MedHelp, hence enabling you to share and sync information between them. The companion app (to the renowned and highly rated “What to Expect When You’re Expecting” books) provides you a daily and weekly tracker complete with fetal development images and useful health tips, news and videos. What To Expect also features a photo journal that enables you to record memories of your pregnancy, while their community feature helps you get in touch with other mothers to share experiences and advice. Check out the book at Amazon and they also have Kindle version for you to download too. This app also comes in the free version (Pregnancy+). However, the $3.99 option allows you to navigate easily and keep track of your pregnancy daily and weekly, count kicks, time contractions and make checklists and appointment reminders. Pregnancy++ also let you see images of real fetuses from every week of pregnancy as well as view fetal development as a computer animation, a 2D ultrasound scan or a 3D ultrasound scan. 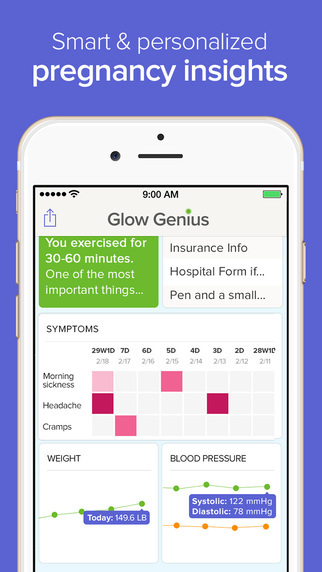 The app is recommended by healthcare providers and pediatricians and was created with the help of leaders in the fields of healthcare, childbirth and parenting to provide expectant parents with the most up-to-date information. 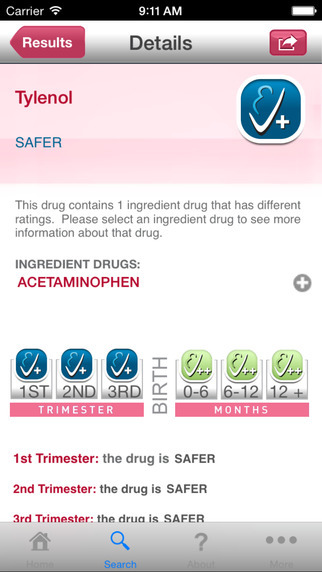 MommyMeds is a helpful reference app that allows parents to look up medications quickly, either by their brand name or by scanning a barcode, in order to immediately find drug safety information, focusing on pregnant or breastfeeding mothers. 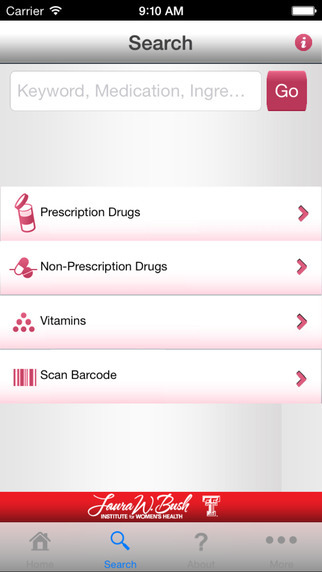 So the next time when you are visiting the pharmacies makes sure to have this app installed on your smartphone. However, this app is not free, though. This app cost $3.99 to purchase. 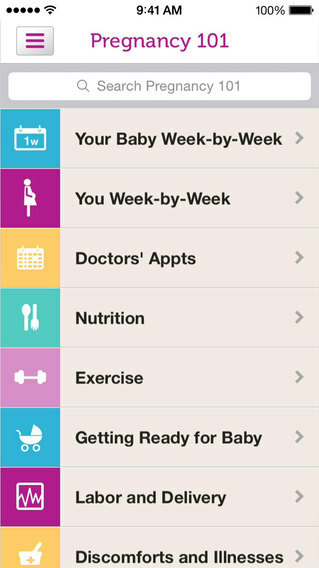 The WebMD Pregnancy app, created by the popular medical reference website, includes most of the features a pregnant woman could want, including information on week-by-week development, a checklist of suggested questions for prenatal visits, a weight tracker, and kick counter, and even a contraction timer, for once labor begins. WebMD Pregnancy has information shared by actual doctors and feature articles that are both reviewed by licensed medical practitioners and well cited from reliable medical origins. You start by creating a WebMD account if you do not have one yet and specifying your due date. From there on, you can record journal entries, capture moments and complete them with a photo or video. 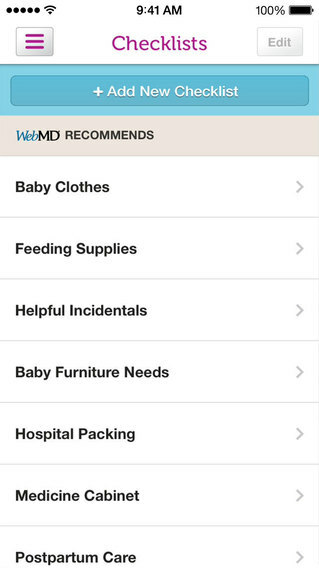 WebMD Pregnancy also has a “Pregnancy 101” section where you can learn about your baby’s development on a weekly basis. There is even a section “Just For Dads”. This app is currently available on iOS only. The Nurture app by Glow (named one of 10 Best iPhone Apps and featured by InStyle, The Guardian, Brit & Co, and many more!) helps you keep track of appointments, allows you to take notes and view useful tips, as well as take a photo of your baby bump daily and turn it into a time lapse. 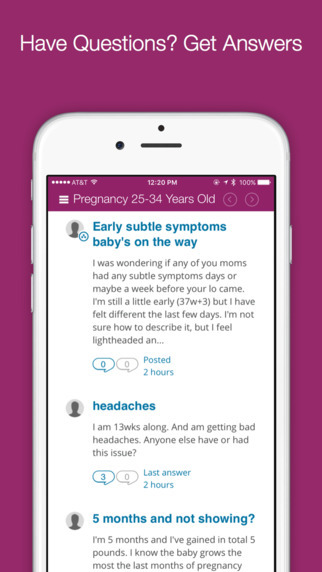 It provides alerts and insights based on data entered, helping you achieve a healthier pregnancy. Shopping for your new baby can take up quite a bit of your time. This is where an app such as BabyList comes in handy. 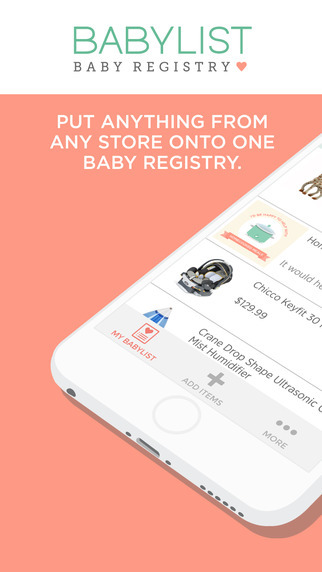 Instead of having to register on multiple retail sites, BabyList compiles all your finds into one list. 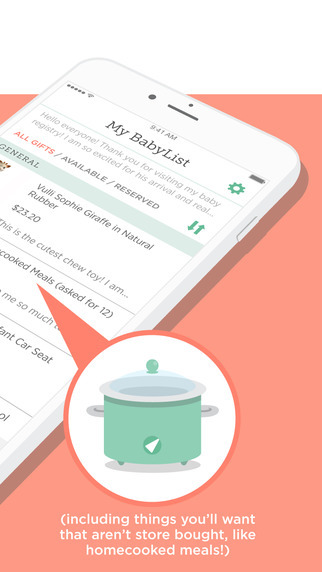 BabyList provides various ways for you to find the items you want either from the web or within the app’s catalog, and it will automatically sync with the list on your device. The items are categorized and price-tagged from stores where they are available online. babyList can even let you add personal notes for yourself or your friends, and easily share the baby registry with them. Shopping for your baby just made easier with BabyList! 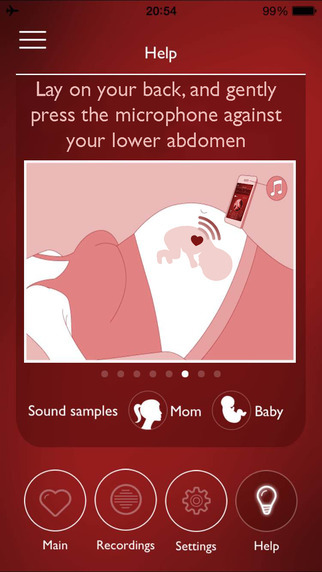 With the My Baby’s Beat, you can turn your smart device into a fetal monitor without other accessories needed. This is especially useful if you cannot wait for your next sonogram to hear your baby’s heartbeat or movements and yet do not want to purchase a fetal stethoscope. My Baby’s Beat is recommended for use during weeks 30 – 40 of your pregnancy, though, so do take note. 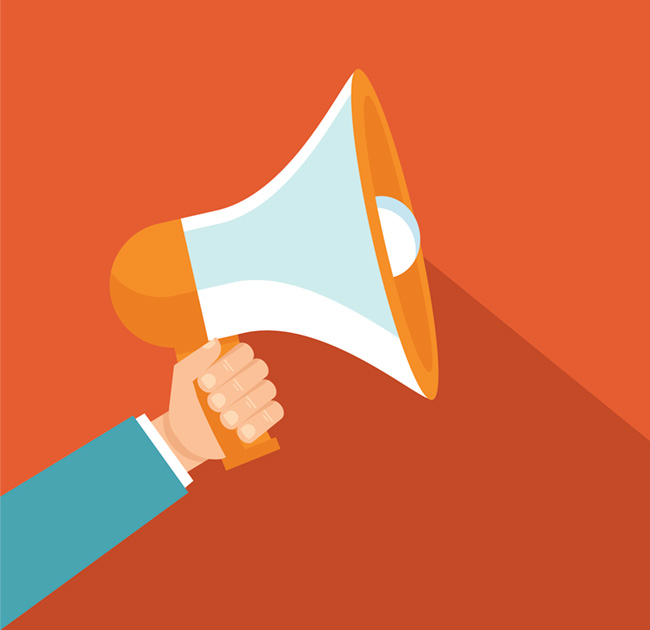 There is also a feature for you to record and share the recordings through email, WhatsApp, Facebook or Twitter. My Baby's Beat will cost $4.99 to purchase at the App Store and $1.99 for Android user. At some point in your pregnancy (if not at the beginning), you are bound to start wondering “What should I name my baby?”. 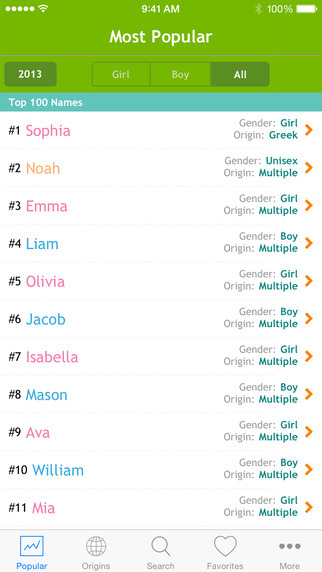 This is where the Baby Names app can help as it has thousands of name suggestions which you can sort either by popularity, gender or origin. Baby Names comes with historical data for the name suggestions, all complete with its meanings, origins and even a guide on how to pronounce the name. There is a premium upgrade that allows users to add, rate and share names, as well as an "Ask Genie" feature that can recommend names that complement the parents' names. How cool is that? 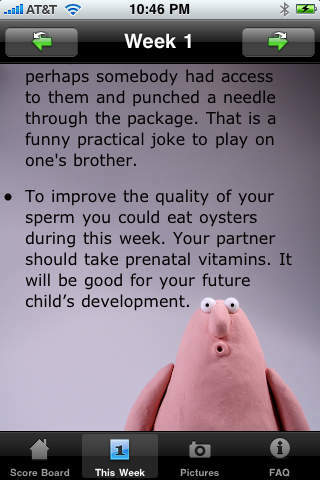 How about an app for the soon-to-be dad instead? 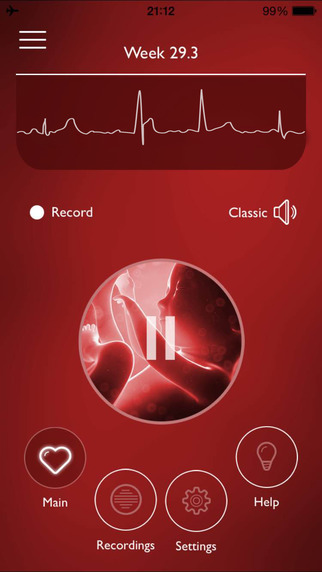 mPregnancy is the first iPhone pregnancy application targeted towards men with a pregnant partner. 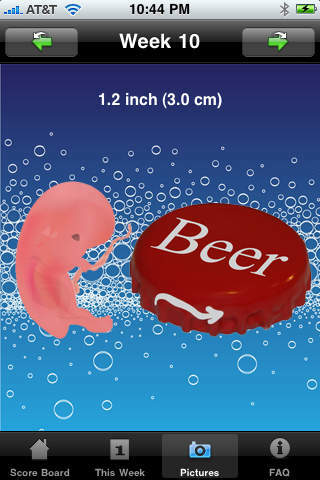 mPregnancy provides useful week-by-week tips in a conversational tone that is easily relatable by men (e.g baby’s size described comparatively to the size of a beer bottle cap, football, etc). mPregnancy also keeps track of the days left in pregnancy and baby’s growth. 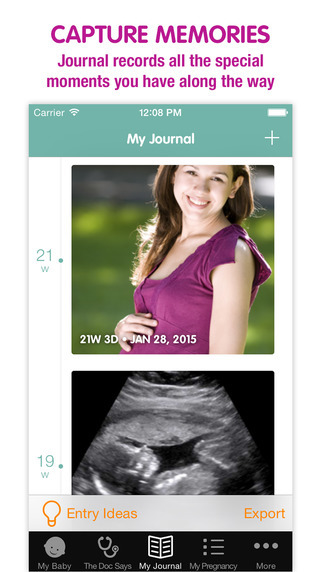 As of this writing, mPregnancy is only available for iOS user. 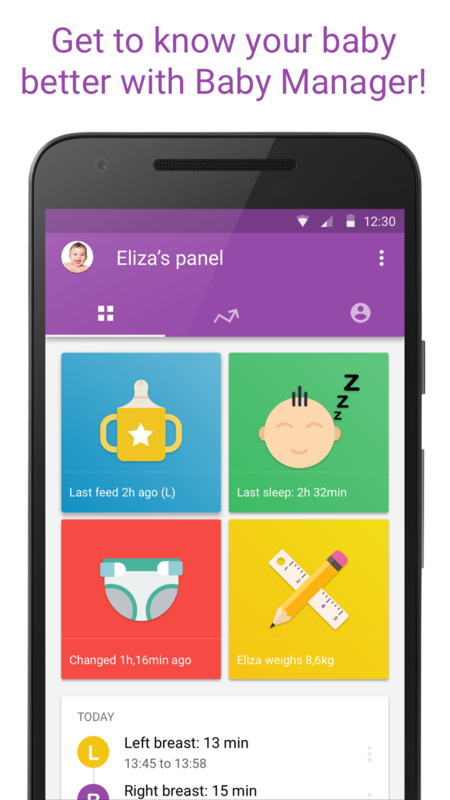 While we cover enough pregnancy apps, how about an app that will make your life parenting your baby a breeze? Check out the app below. Get some parenting help from this simple, yet intuitive app. Baby Manager includes features that enable you to record your baby’s feeding and sleep sessions, as well as diaper changes and growth. Baby Manager also built in easy-to-view chart and reports that provide a quick view of how the baby is doing and enables you to get insights into the baby’s trends. Baby Manager also allow you to synchronize with your partner’s device is done, and the app allows you to log and manage multiple babies’ growths. This app is currently available on Android only. 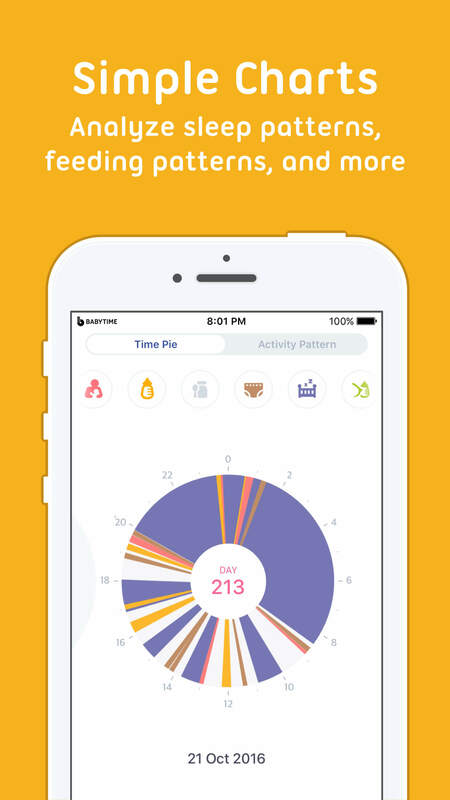 BabyTime with more than half a million download is an activity tracking app to guide parents to raise a healthy baby. It takes the hassle of tracking a baby’s daily activities with a notebook and pen away and make it possible to record every aspect of a child care conveniently on the smartphone. Users can record activities like breastfeeding, diaper changes, and sleep and watch as the data are converted into a beautiful visual graph of the baby’s growth! Such features let caregivers gain further insight into a child’s development and care. 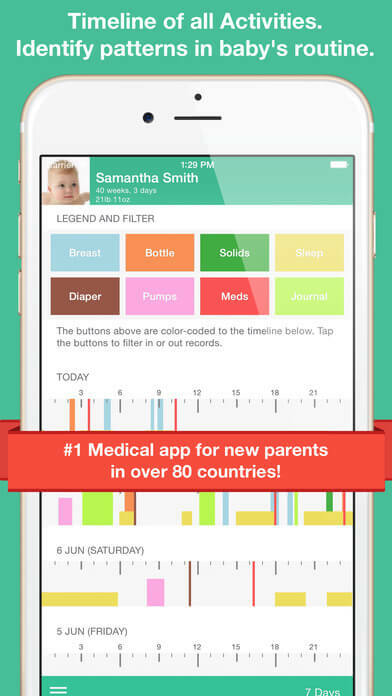 BabyTime is currently available for worldwide download for iOS user only. Unless you can understand Korean, Android version is currently only available in Korean language only. However, the Android version is scheduled to be released globally at the beginning of 2017. You can setup as many Android or iPhones to sync with each other, allowing all caregivers to track your baby on their own devices. Comprehensive graphs and reports allow you quickly determine how your child is progressing. A timeline screen also allows you to determine if any patterns/trends are emerging from your baby’s behavior. A great bonus is that Feed Baby includes a huge selection of helpful widgets on both Android and iPhone that help you to record and track your baby’s activities without even having to open the app. 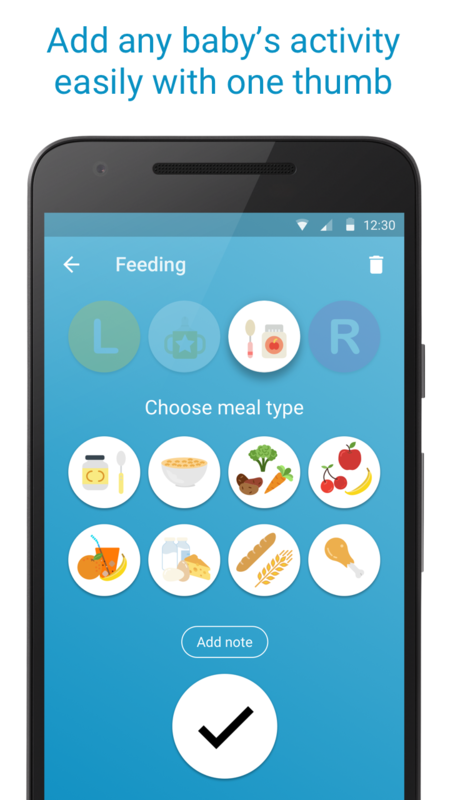 Feed Baby is 100% free to download on both Android and iPhone. However, there is a pro version that let you unlock more features for Android. Hard to Choose? How About Try all of Them? In our opinion all these apps are great, and they should be a great companion while you are pregnant or even post-pregnant. While each app is supposed to help you to track your pregnancy efficiently but each app does work differently. So, go ahead and download all of them and try out yourself since most of the apps are free to download. 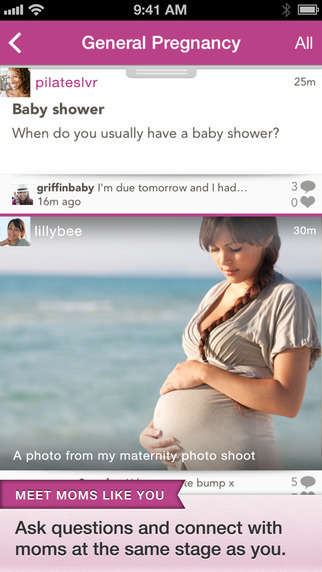 Let us know which of these best pregnancy apps is your favorite by commenting it below. Hemp Milk For Babies: The Almost SUPER Food For Your Baby!